Patients with spinal tumors will experience back or neck pain. These neck and back pains will often worsen at night and with physical activity. Tumors in the neck, called cervical tumors, will often cause numbness and/or weakness in the arms or legs. Tumors in the mid-back, called thoracic tumors may cause numbness and/or weakness in the chest or legs. Patients may also experience difficulty walking. These are all pretty vague indicators that are also common with other types of serious injuries. So, these symptoms should always be reported to a doctor for precise and quick diagnosis. When spinal tumors start to compress the spinal cord or adjacent nerves, they can cause severe pain. Even if the tumor is noncancerous, it can still be life-threatening. Growths of any kind on the spine can cause neurological problems and even paralysis, as they spread and create pressure. Spinal tumors of all types can be life-threatening and cause permanent disability. So, very often the first treatment option is to remove the tumor. NSH offers the ability to remove them safely and effectively. 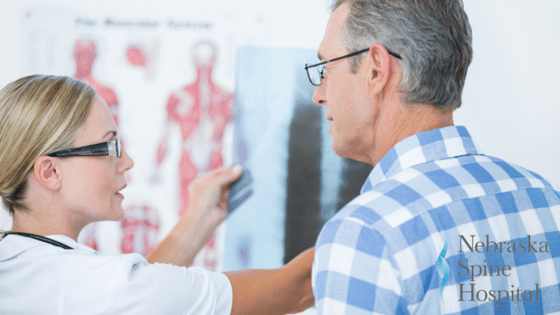 If a tumor cannot be completely removed or is inoperable, there are options we can provide at Nebraska Spine Hospital to help treat these tumors. These options include radiation therapy and chemotherapy, and sometimes these ancillary treatments can include national research trials if so indicated. Would you like to know more about spinal tumors? Check out this short video from Nebraska Spine Hospital, or contact us to speak with a NSH representative. We’re happy to answer questions and give advice.